Last week, I spoke with John Ralston Saul on his book A Fair Country: Telling Truths About Canada. This is the interview. Please note he is referring to his appearance at the Ottawa International Writer’s Festival, which was this past Sunday. Saul is an excellent author: he creates prose that is engaging and interesting, drawing the reader in even if regardless of whether they buy the argument. That’s at least where I am- A Fair Country, at least in the first third, is a book about the origins of Canada’s political culture. There are a couple of broad thoughts as to how Canada’s political culture was formed: the first looks at ideas being imported by people that come to the country (so, the loyalists brought a deference to authority, as an example), the other looks to the evolution of attitudes based on events (the Act of Union forces English and French Canada to work together, producing bi-culturalism.) I tend to think the truth lies somewhere in the middle. Saul takes a different approach: Canada, he says, is a Metis Nation, suggesting that the aboriginal influence on Canadian political culture is as important as all the rest, if not more important. Essentially, most of the modern things that we take pride in as Canadians, such as cultural cooperation, he ties back to an aboriginal influence, with more or less a straight line. And I just don’t buy it. Certainly, Canada’s aboriginal population played an important role in Canada’s early development- remember that through much of the 17th century, New France had a direct commercial relationship with aboriginals, and relied on them to help expand and defend the colony. But really, I think much of Canada’s cultural identity, at least as we know it now, really doesn’t start to emerge before a couple of hundred years ago, as you saw massive migration into the country of European settlers. And I don’t just mean loyalists and Quebeckers, because by the beginning of the 20th century Canada was quickly filling itself with people from all across the world (or at least all across Europe), and, with a country that largely still needed to be built we had to quickly figure out ways of working together. Also (and perhaps a bit flippantly), given that Canada put its best efforts, to say the least, into diminishing the role of Aboriginal culture for much of the last 300 years, if you accept Saul’s argument it certainly did take a while for the aboriginal parts of our culture to benefit Canada’s aboriginals. None of this should be taken that the book is bad, it’s just that I disagree. The role of public intellectuals like Saul isn’t to feed an intellectual echo box, it is to introduce new ideas into the discussion. Saul takes a different direction than most, which get’s us all talking about why we think and act the way we do. That’s always a good discussion to have, so that’s the value in the book. It should be noted that he pivots in the second half of the book, which becomes more of a lament for what Canada should be, outlining a series of various faults from ineffective elites, who are unwilling or unable to set us in the right direction, to a chapter criticizing Ottawa that has lead to predictable responses from the usual suspects. This is the more interesting part of the book, and I think raises some useful insights into contemporary Canada. That said, I’m not sure part two can exist or be properly appreciated without part 1, so don’t skip ahead. Fun Tuesday Special Blend fact: I think it is fair to say that of all the interviews Adam and I have done, Saul is probably the only person that has lived in a house important enough to justify tour guides. It’s been almost 11 months since I interviewed Warren Kinsella about his book The War Room, and this is just one of many of the interviews I have in queue to be posted pending me writing something down about them- I’m a man of great ambitions, but easily distracted. Anyway, this seems as good a time as any to get this one up. My abrigid thoughts: I really enjoyed the book- Kinsella is an engaging story teller, and this book aptly shows that. It was pitched at the time as more of a “how to”, and to an extent it is, but the “how” is all in a series of anecdotes and examples, mostly from his own experience, but some from elsewhere, notably James Carville. Essentially, if you dig his blog, you’ll probably like this. As an aside- remembering that this was recorded 11 months ago- note that Kinsella suggests that there is a certain amount of foolishness in how the Tories were prepping their War Room. That seems pretty prescient after a month of election. Now, I do a fair number of book interviews for a guy that essentially does radio as a hobby. I won’t lie, there is a certain giddy thrill when you get to casually name drop authors you’ve met and things they’ve told you about their experiences, thoughts, and so forth that don’t get recorded on the interview. Perhaps that changes when you do it more often and it becomes rote, but I hope not: for me, anyway, the novelty makes me pay extra attention to what I’m reading, trying to figure out what it a book is actually saying and to get the author to move past their stock answers. But I digress, as this post is verging too far into “gonzo” territory. Dr. James Orbinski’s book melds a memoir and treatise on the state of modern civil society humanitarianism. A book on either would probably be worth reading: he has, after all, a first hand perspective about some of the more notable Human tragedies of the last quarter century, including the Rwandan genocide, Somalia during its civil war, and as Zaire became the Democratic Republic of Congo. His involvement with MSF as it sorted out how it was supposed to operate in the vacuum following the Cold War, and what the role of civil society should be therein, would be similarly authoritative. Instead, the former is used to explore the latter. The two parts play off well against each other, as anecdotes alone can often seem hollow and devoid of context, theory and practice can feel detached from the real world. Instead, the former is used to explore the latter, making his point without ever really saying it outright. And the point? Orbinski focuses on the need to protect “humanitarian space” and makes the case that humanitarian organizations almost by necessity must become political organizations. This is not to say that they must pick sides (indeed staying above the fray of the conflict is emphasized as important), but that it is important that such organizations call a spade a spade and talk openly and publicly about when they face challenges. “Humanitarian space” is a concept that emerges as the goals and purposes of military or political interests within a country run into conflict with the independence of humanitarian organizations (in the interview, he talks a bit about how this has played out in Iraq, but in the book the theme can be found in pretty much every discussion about his experiences in Africa.) This is again a situation where the personal and the theoretical mesh well: it’s one thing to talk about how civil society is occasionally exploited by governmental actors in the abstract, it’s another to look at how it has affected you or your colleagues ability to do your job and why this led you in a certain direction. Ultimately, if humanitarian organizations must speak out when they face particular challenges in particular places, it is logically necessary that they speak out publicly about such pressures generally. An Imperfect Offering does just that, accessibly bringing an important (and perhaps overlooked) perspective to the public discussion about conflict and humanitarianism. In our ongoing series of interviews regarding new book releases, I (Adam Coombs) talked with Richard Gwyn regarding his new biography of John A. Macdonald, entitled John A: The Man Who Made Us. This is the first volume of a projected two volume biography on Macdonald. The interview first aired in October and is available at the end of this post. In the 1840s Britain began to move toward complete free trade. Combined with a worldwide economic downturn, manufacturers and farmers in the United Provinces of Canada began to rightly fear economic ruin. Over a three year period, property values in Montreal had fallen by over 50% while Canada’s exports had fallen by over 40%. In response, over 1000 Montreal businessmen, including two Molsons and two Redpaths, supported annexation into the United States. During this period John A. made no speeches nor did he write letters to a sympathetic newspaper. Rather, in typical fashion, he quietly helped to organize the British America League which argued for unrestricted reciprocity, or free trade, with the United States. By the time the group disbanded in 1850 the same Montreal businessmen had embraced the idea of reciprocity. Macdonald had never made any definitive statement regarding his own beliefs yet the current crisis was averted. The entire annexation crisis and Macdonald’s reaction exemplify both his leadership style and the political culture of pre-confederation Canada. Macdonald was, by supporters and enemies alike, called “old tomorrow” for his strategy of avoiding taking positions on issues and delaying decisions until a suitable result was achieved. Fiery speeches and declarations caused division and in the multi-religious, multi-lingual patchwork of 1850s Canada and a successful politician could never afford to be divisive. Furthermore, Canada as such didn’t exist yet and was constantly threatened by both internal tensions and the ever preset specter of the United States. It is both the personal style of Macdonald and the challenges threatening our early country which Gwyn focuses on. In popular culture and Canadian historiography, John A is portrayed either as the loveable drunk who was utterly corrupt or as a the mythic figure that created our nation with his own bare hands. Gwyn seeks to deal with both these perceptions and create a new version of Macdonald. Unlike other biographies of Macdonald, Gwyn focuses on the man’s personal life beyond simply his drinking. There are engaging accounts of his attempts to care for his sick wife Isabella and of his attempts to re-connect with his estranged son Hugh John. These snippets of his personal life serve to add much needed depth to a man who is too often portrayed as someone devoid of true human characteristics. Gwyn doesn’t minimize Macdonald’s accomplishments but rather seeks to allow the reader to understand the man behind the Canadian myth. The largest complaint about the book is it is pop academia. While it is extremely well written and engaging, the lack of footnotes, for a history geek like myself, occasionally got annoying. As well anyone well versed in Canadian history will find many of the sections which provide context as dull. Gwyn even warns readers with a basic knowledge of early Canadian politics to skip certain sections. If you are expecting a scholarly, in depth biography then you will be disappointed. However if you want an entertaining and engaging read then this book is certainly highly recommended. This is the interview I did with John English regarding Citizen of the World. It is a bit old -a little more than a year- but is worth posting nonetheless. I suspect that under many christmas trees will be some of the latest crop of political autobiographies, while biography of a dead figure is different, this book really sets the standard for what political writing should do. When you read it, and you should, it’s important to remember that as much as the book looks at the rise of a young Trudeau, it is also a good primer in the changing intellectual and cultural climate in Quebec from the 30s through to the late 60s, at least for someone like me that is not very well versed in Quebec historiography. In that sense the book is a double success: a thorough and interesting biography, that in a very accessible way offers real insight into a political figure, but also into the times in which he inhabited. English’s book is as good as any at reminding that even the most powerful figures come from somewhere and someplace, and if that were to change, so to would the person as we know them. As always, if the sound is accelerated, be sure to download the file or subscribe via itunes. Those reading through blogawa.ca should come directly to the page for the file. As part of my ongoing efforts to post my ever-growing queue of interviews, here is William Marsden in coversation about his book Stupid to the Last Drop (Amazon). This first aired in the early part of October, Maclean’s ran an excerpt at about that time. That excerpt speaks to a compelling opening anecdote about the troubles of – and desperation to- get the oil out of the tar sands. In the early post war days, the best way that anyone could figure was to plant a nuclear bomb deep into the earth, detonate it, and then pump out the freshly-freed oil. Apparently it was tried a couple of times in the Soviet Union, and oil was successfully extracted from rocks. It also was unusable because of radioactivity, but that was a minor point. Importantly, some in Alberta thought that this was a good idea. Now obviously nobody is suggesting that we bomb parts of Northern Alberta, and during the early post war period there were more than a few people that thought nuclear bombs might be used commercially. Part of it was people being naive, part of it was people seeing a new technology that they thought would let them do through magic what was difficult and impossible before. But Marsden makes the case that the environmental impact of current oil sands development is not unlike that of a nuclear bomb: we destroy existing forests, drain rivers to make poisoned lakes, with the necessary outcome that eventually there will be an unusable, probably toxic, desert. These are the sorts of things that we usually think of as happening in developing countries, desperate for cash and unable to demand higher environmental standards; here we are willing participants. But this is not just another tome about the destructive nature of the oil industry, focusing equally on what benefit Alberta is actually drawing from the industry. Hint: it’s not as much as it should be, certainly not for the costs. He looks to the Heritage fund, a fraction the size a similar program in Norway; he looks to how royalties are being used, again contrasting with the efforts of Norway to use this temporary wealth to diversify and grow the economy. Spoiler alert: Alberta isn’t doing much of that. Education and infrastructure are also touched, each again making it look like Alberta is forgetting the rocks on the shore while riding the wave now. 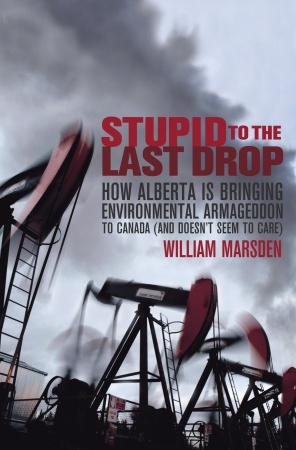 I spoke with Marsden a day or two after the first reports on the oil royalties came out, so they aren’t directly reflected in the book, but that Alberta is short changing itself- and that some defended the status quo- is very much in keeping with the image painted. Now, Marsden is an investigative journalist, and this is very much a piece of investigative journalism. This should not be read as a slag: it is an engaging, well written book that makes a very clear and important case. At times, I wanted footnotes so I could go and find the sources, but I am a geek. I also expect that many will detract and say that he is too apocalyptic, and certainly the book certainly can feel like that. In the end, however, he asks the sorts of questions that we should be asking before pursuing these sorts of projects, and makes it eminently clear that Alberta is not. Which more or less draws us to the title of the post: in the best episode of the simpsons, Monorail salesman Lyle Lanley remarks that “a town with money is like a mule with a spinning wheel. No one knows how he got it and danged if he knows how to use it!” He then, ofcourse, promptly sells them a second-rate, go no where monorail. I think that Alberta, as described in the book, falls into this trap: they have the oil, but damned if they know how to make it work for them. I’ll be speaking (with any luck) with at least one of Janice Stein or Eugene Lang next week about The Unexpected War, but thought that I’d do an Andrew Potter impression and comment on the best part of the book as I read it. This book certainly looks at how we ended up in Afghanistan, engagingly so far, but the real lesson to draw from the book is how we make decisions in Canada. 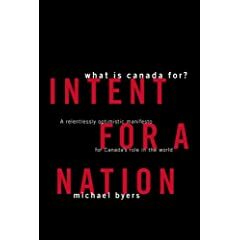 I had the chance to speak with Michael Byers, professor of International Politics at the University of British Columbia and author of Intent For A Nation to day about his new book. I plan on writing a proper review later, but should point out that the subtitle “A relentlessly optimistic manifesto for Canada’s role in the world” is very apt: at times, the book almost feels like it could be titled “Things Lloyd Axeworthy might be doing if he was Prime Minister and not President of the University of Winnepeg.” I’m cool with that, as even if I hold a much more cynical view of things, its nice to know that someone can make a passioned, hopeful case that we can do more than trade against perceived past glories as we fiddle about as a nation. Note: If you experience problems with an embedded player, such as accelerated voices, download the file or subscribe through iTunes.